I feel your pain: do humans and animals suffer similarly? Dr Stuart Derbyshire and Professor Anthony Jones will try to untangle the uniqueness and commonality of pain and suffering for humans and animals. The suggestion of animal pain assumes an important level of equivalence between the psychological experience and biological development of animals and humans. These assumptions require critical assessment. Although there is biological similarity across the animal kingdom including shared nerve fibres that carry sensory information and trigger defensive reactions and comparable brain regions and hormonal stress responses, considerable biological differences between humans and animals remain manifold. To put it bluntly, the brains of all animals are underdeveloped compared to human brains and most neuroscientists believe that brain development has an important and necessary relationship with experience. Clearly for some, and maybe for all animals, pain experience can be rejected because they simply do not have the brains for it. More provocatively, however, subjective experience, including pain, cannot be directly inferred from biological measures because such measures do not account for the contents of experience in general, and of pain in particular. To understand pain experience there is a necessity to examine the psychology of pain. Pain, as experienced by conscious human beings, is a subjective experience with content. That content is embedded in a symbolic system of language that animals have no access to. Thus pain is not merely incompatible with the biology of animals, pain is incompatible with the cognitive and emotional development of animals. There are, therefore, good reasons to reject any equivalence of human and animal pain experience. There is, however, a perhaps understandable disquiet in denying animals any form of pain or suffering. It is difficult to reject the idea that an animal writhing in apparent pain is not in actual pain - something like pain appears to be shared. There is, possibly, a useful distinction between being in pain and knowing that I am in pain. Both animals and humans might be said to be in a state of pain but only humans can experience that they are in pain and explicitly share their condition with others as an acknowledged fact of being. This distinction between being and knowledge feels like a distinction that can work but, as we will explore, it does not work in the way expected because sheer being can only be lived and not experienced. ...and sorry but that's where the recording cut out. This discussion is jointly organised by the Manchester Salon and the Cafe Scientifique, Manchester to help develop a deeper appreciation of the science rationality behind discussions on public policy. To ensure the widest possible engagement, this discussion is included as part of the Manchester Science Festival programme as a trailblazer event. 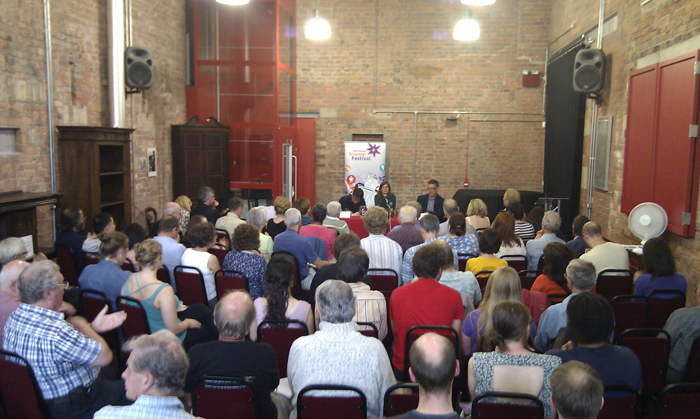 The International Anthony Burgess Foundation are thanked for generously making the venue available for the discussion, and Simply Better IT have also helped make this discussion possible by covering the costs associated with speakers' travel and accommodation costs. For the second year, the Manchester Salon is participating in the fabulous Manchester Science Festival, which is celebrating its fifth year. With over 200 events for families and adults, you can expect an exciting nine days of cutting-edge research, the brightest minds and amazing events. You’ll have the chance to delve into immersive experiences, explore the science of the city by foot, join in the debate, enjoy hands-on activities, see awe-inspiring films and much more. Watch out for trailblazers throughout the year and join us at events throughout Greater Manchester during 22 – 30 October 2011. The International Anthony Burgess Foundation Engine House, Chorlton Mill, Cambridge Street, Manchester, M1 5BY. The Engine House is available to hire for all occasions: lectures, readings, music events, film screenings, meetings, conferences, parties and more. Facilities include a flexible performance space, accommodating up to 100 (seated theatre-style, more if standing); has a PA system, lectern and microphones, mixing desk and facility to record events. Stage lighting is installed. There is a Bosendorfer grand piano available to play, a Steinway practice piano and a William Foster harpsichord, all once the property of Anthony Burgess himself. They also have a 8′x6′ fastfold screen for front and rear projection, and a high-quality multimedia projector. If you would like to sponsor a future discussion, or partner in promoting it, please get in touch via the sponsorship page or the sponsor the Salon form.